The Expression Toolbox was created to help take the pain out of using and locating expressions. At some point you've probably come across an expression that you find yourself using on every other project you work on. The question is where do you store this expression? I noticed that a lot of people were storing their expressions in text files, without documentation of how they were used or where it could be found. Without knowing who created the expression or how to use it, you're left waiting on an answer from a mailing list or web forum on how to properly apply it. The Toolbox is a centralized location for you to store commonly used expressions, as well as making it easy to apply and retrofit to the comp you're currently working on. You can group expressions that require multiple properties and controls to be enabled. Ability to apply current expression to the currently selected property of any layer. 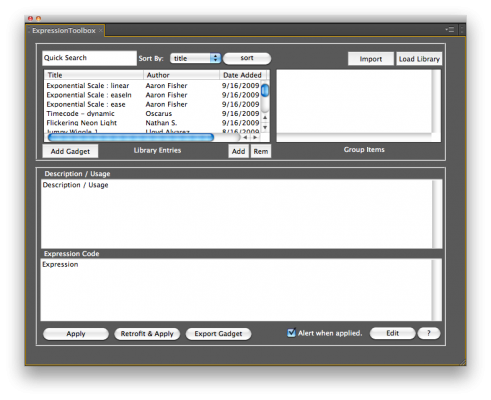 So go ahead and give the Expression Toolbox a try, and see how easy it can be to organize your expression collection without having to dig through text files or forum posts to find your expressions. Windows 7 has a LOT of security built in, which keeps you from writing to all directories except My Documents. This is causing the script to silently fail, it will go through the motions of saving but the library remains unchanged, this is because you don't have permission to write to the file or directory. Follow this link for information on how give yourself permission to modify directories / files. Note: There is a known issue within the CS5 ScriptUI where the multi-column listbox doesn't refresh properly when it is populated with content (in this case expressions). The simple workaround is to slide one of the dividers and it will display the scrollbar and fix any overlapping text.